The environmental action “Keep Aegean Blue” of the Region of South Aegean in cooperation with the ocean conservation organization “All For Blue”, took place on Thursday, March 14, in Tigaki, Kos, with the absolute success and enthusiastic participation of the Lyceum students participating in the program. After Paros, Leros and Kalymnos island, the largest mission for beach & underwater cleanups in Greece, continued in Kos with impressive results. One tonne of trash, including a chair, a boat (probably from refugees), ropes, pipes, bags, bottles and other objects, managed to get off the coast and the ocean in Karnagio, in the Tigaki area of ​​Kos, Secondary Lyceum of the Antimacheia and Zipariou Kos schools, the Hellenic Hellenic Rescue team, scuba divers, volunteers from the Triton nautical club and representatives of the Coast Guard who participated in the ocean conservation seminar. South Aegean Regional Governor, Mr. George Hadjimarkos, Mr. George Halkidios, and Regional Advisors Mrs. Eridikis Nakis and Mr. Dimitris Hamatzoglou participated in the action as well. The speaker at the seminar was Katerina Topouzoglou, a free-diving instructor, World Underwater Target Shooting Champion and founder of the All for Blue Marine Conservation Agency, who briefed the participants on the purpose and action of the Agency. 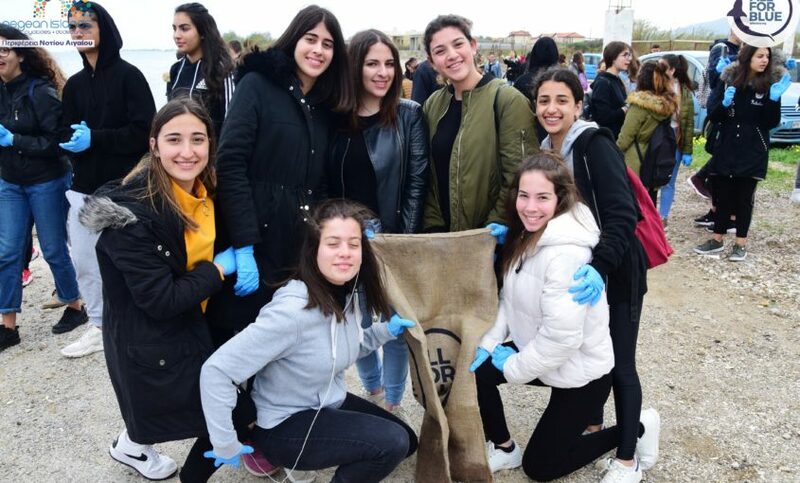 Katerina Topouzoglou and τηε “All For Blue” team, are traveling with the motor boat hundreds of nautical miles to meet the students of participating schools in the islands and all those who are environmentally aware and expect to contribute to the effort for beach & underwater cleanups. All actions on island beaches are conducted with absolute safety, and this year we have instead of plastic bags, reusable sacks to collect trash without burdening the environment. Kos, is the fourth island after Paros and Leros, and Kalymnos where the “Keep Aegaen Blue” action took place. The program continues with the following stations: Rhodes, Symi, Tilos and Karpathos, followed by islands of the Cyclades, Santorini, Milos, Naxos, Syros, Andros, Tinos and Mykonos.